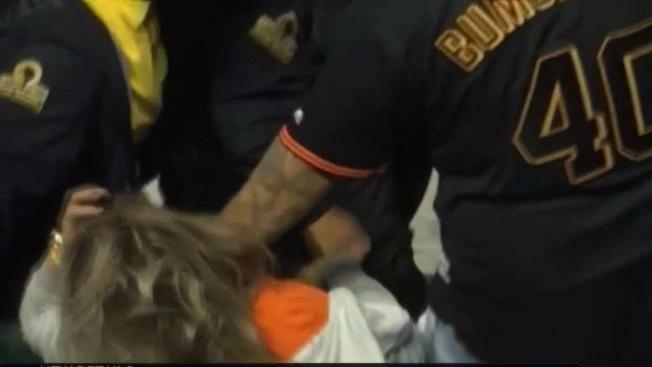 While the San Francisco Giants and Oakland Athletics duked it out on the diamond Monday night, a security guard and a fan became entangled in a fight in the stands at the Oakland Coliseum. 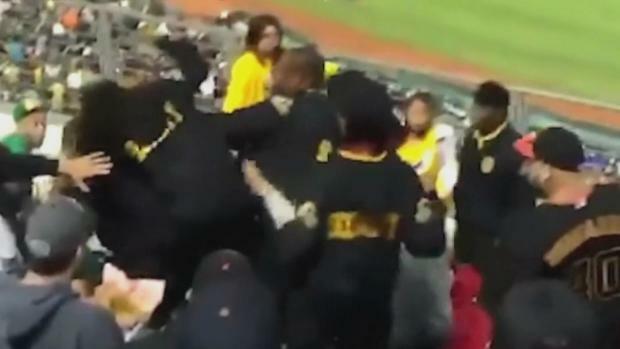 Footage from the clash in the upper deck of the stadium appeared to show a security guard throwing punches at what appears to be a female fan before pulling her down by the hair. Several other security guards surrounding the melee then tried to pull the two apart. "During tonight’s game, there was an incident involving a security guard," the team wrote in a statement following the incident. "We contract with a third-party security company and are currently investigating the situation. Violence in any form is not acceptable. We take this incident seriously." The incident appeared to stem from a security guard's stolen backpack, according to the Oakland Police Department. The backpack, which was taken while the guard was on duty, was located by another security guard in possession of a fan in another section. When that security officer confronted the fan, a fight ensued, police said. 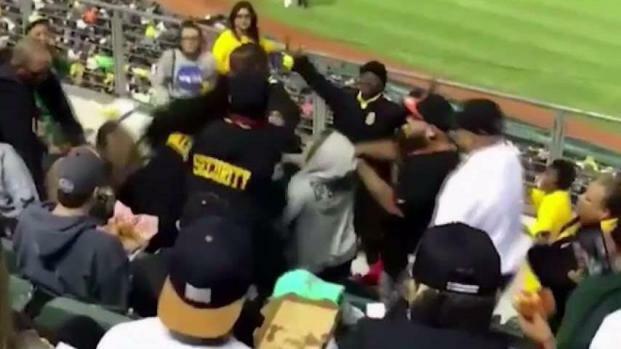 While the San Francisco Giants and Oakland Athletics duked it out on the diamond Monday night, a security guard and a fan became entangled in a fight in the stands at the Oakland Coliseum. Damian Trujillo reports. Security had escorted the fan out of stadium before Oakland police officers arrived on scene. The backpack was recovered, but some items were missing from it, police said. A’s fans who hadn’t even seen the video were bothered by the reports of the fight. "A security guard was throwing punches? That’s horrible," Vashti Gibson said. "You don’t treat people like that. You’re supposed to make sure that we’re safe, not fight us. We come to you for help as a security guard, not for us to defend ourselves against you." Henry Aguilar agreed: "Someone who works here ends up fighting a fan? Pretty crazy." Witnesses said the security guard had beer thrown at her during the confrontation, and at least one fan said the guard may have had a good reason to swing. "Some people are very nasty and unruly nowadays, so she was probably defending herself," Khadijah Webb said. While the San Francisco Giants and Oakland Athletics duked it out on the diamond Monday night, a security guard and a fan became entangled in a fight in the stands at the Oakland Coliseum. Pete Suratos reports. The A's said Tuesday they have launched an investigation into the incident and will forward their findings to police. The team also announced that the security guard involved in the altercation will no longer work at Oakland games moving forward. The team also will not use security subcontractor USSA for Tuesday night's game and is re-evaluating the company's contract. The Giants and A's return to the Oakland Coliseum Tuesday night for the second game of the four-game Bay Bridge Series split between the two clubs.